Coconut oil is a product which I know many of you will already use day to day in your beauty routines. If you don't use coconut oil already though, you are missing out! I've only started using coconut oil in the past couple of months and now I really couldn't live without it! 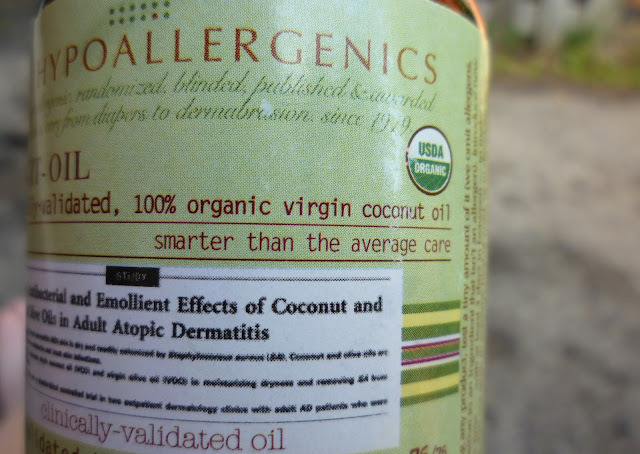 When looking for a coconut oil to buy, you ideally want to go for food-grade virgin coconut oil. 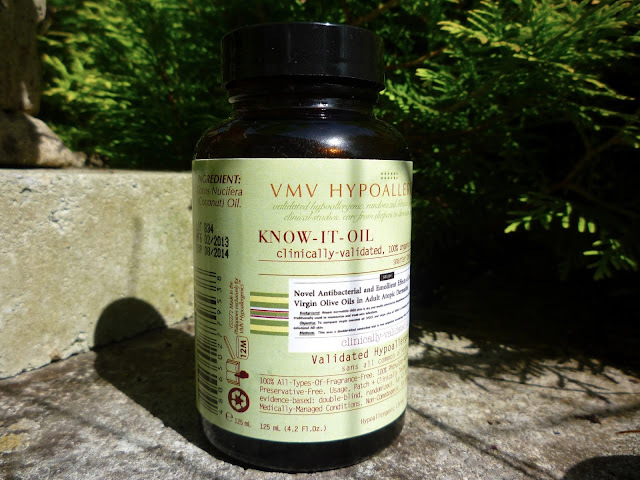 I'm currently using VMV Hypoallergenics Know-it-Oil* (RRP £16.00 for 125ml) which is simply pure cold-1st-pressed, USDA certified organic, pure virgin coconut oil from the Philippines. It's worth noting there are many other brands that sell pure coconut oil in larger jars for a very reasonable price so it is definitely worth shopping around if you're likely to need larger quantities. Coconut oil 'butters' at temperatures below 24°C, so here in England it spends most of it's time in white solid form. At the moment though with the 30°C+ weather we've been having it's a completely clear liquid which makes an interesting change from it's usual state! This oil is commonly know for it's antibacterial, emollient and antioxidant properties so it's no wonder that it is so widely loved. There are so many amazing uses for coconut oil that this post would get ridiculously long if I listed them all, so for now I'm just going to run through my current top 5 favourite uses! This is probably my favourite use for coconut oil at the moment! It removes make-up so well, even the most stubborn mascaras. I also like use this as part two of a double cleanse if I've had a lot of make-up on some days - it's amazing how much make-up can still be left on your skin after the first round of cleansing so a double cleanse can really help the condition of your skin. Coconut oil is my go-to moisturiser to relieve my legs after shaving. It also works really well for me on my dry patches of eczema on my hands as it absorbs instantly leaving no residue. Apparently with regular use it can also slow down the development of wrinkles with age, so I suppose I'll have to see how the wrinkle situation is in 20-30 years time! I have to give credit to Gemma (Gemma Means Jewel) for this one since I'd never thought of trying this until she mentioned it on her blog recently! You just need to swirl your brushes around in the palm of your hand with a little coconut oil and all the make-up comes off perfectly. As an added bonus your brushes will be left amazingly soft too! This oil is perfect for cooking with as it has a high smoke point and is great for high temperature cooking compared with olive or vegetable oils. Incorporating coconut oil into your diet can have numerous benefits as it's a source of healthy fats and can also help improve digestion. I love the taste of it too! There's a great recipe over at A Beautiful World here if you need some inspiration! Coconut oil literally works wonders on my dry, frizzy hair! For a quick fix you can just rub a small amount into the mid-lengths and ends of your hair and leave for about 10 minutes before rinsing off in the shower. My favourite way to use it though is to use a little more all over the hair and scalp before bed, wrap it up and leave in overnight for a more intense moisture boost. If you have very oily roots or fine hair though you might want to only apply to the lengths of the hair and stay away from the roots. I know there are so many other ways to use coconut oil which I haven't mentioned here so would love to hear if you have any suggestions for me to try out! What's your favourite use for coconut oil? I really really really need to add this to my shopping cart the next time I am in Trader Joe's. I have been seeing so many great posts about Coconut Oil that I simply can't hold out any longer! Thanks for posting all of those tips..I would have never thought about putting it on my legs as a moisturizer too! I've been wanting to try coconut oil so this was really helpful thank you! I had no idea it could be used for so many different things. Would never have thought to use it to clean makeup brushes! What a cool idea :) I love the smell of coconut - need to try the oil given it's so versatile. It is an amazing product, so versatile, xoxo. I love using coconut oil as a hair treatment! (I'm actually doing an oil treatment in my hair as I type this, haha!) I find that the result is quite different to using olive or avocado oils - not only does coconut oil leave your hair silky soft but I feel it also gives the hair an extra boost of volume!